2016-December-14: Guest lecture by Dr. Gunho Sohn, York University, at 2:00 PM in E-4. Details. 2016-December-13: Alaeldin Suliman defends his Ph.D. dissertation at 1:30 PM in E-11. Details. 2016-November-15: GGE Graduate Student Seminar. Details. 2016-November-10: Yong-Won Ahn defends his Ph.D. dissertation at 9:00 AM in C-25. Details. 2016-November-8: Tulloch Engineering will give a presentation at 12:30 PM in E-4, with interviews to follow. 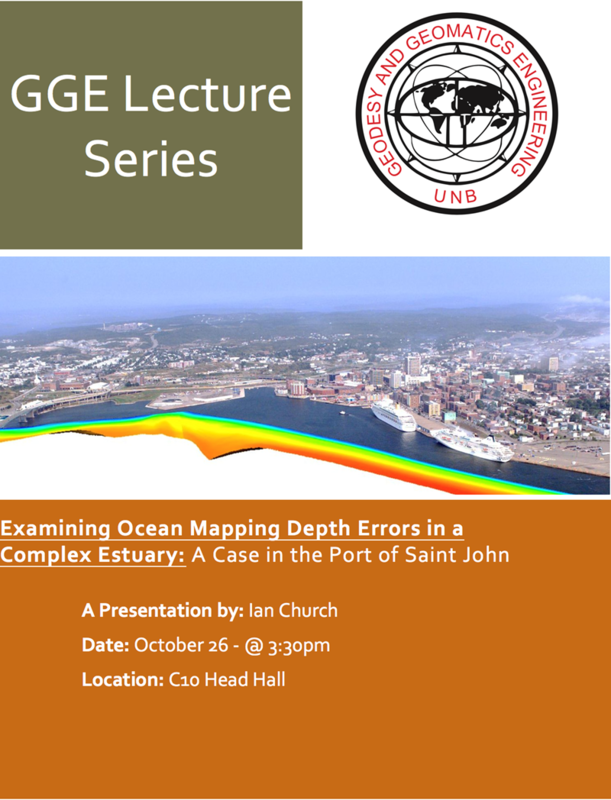 2016-October-26: Examining Ocean Mapping Depth Errors in a Complex Estuary: A Case in the Port of Saint John at 3:30 PM in C-10. Details. 2016-October-25: McElhanney Land Surveying and McElhanney Consulting will give a presentation at 12:30 PM in E-4. Recruitment Visit by Surveyors on Site Inc.
2016-October-20: Surveyors on Site will give a presentation at 12:30 PM in E-4. 2016-October-14: Eduardo Infante defends his M.Sc.E. thesis at 2:30 PM in E-11. Details. 2016-October-5: Eleven Years of Google Maps: Past! and Future? at 4:00 PM in C-111. Details. 2016-May-13: Danar Pratomo defends his Ph.D. dissertation at 1:00 PM in E-11. Details. 2016-May-4: Anand Hiroji defends his Ph.D. dissertation at 2:00 PM in E-11. Details. 2016-April-27: Krista Amolins defends her Ph.D. dissertation at 1:00 PM in E-11. Details. 2016-April-4: TME Lunch and Learn presents Simon Newby: How I Stumbled into My Dream Job, at 12:30 PM in H224. Details. 2016-April-1: Midwest Surveys will give a presentation at 9:00 AM in E-4. Details. 2016-March-23: Inside MIT and How Geomatics Contributes to MIT. In 2015, Dr. Yun Zhang worked at MIT as a visiting professor for eight months. In this lecture, he will share his observations on daily life inside MIT and how MIT made it to the top university in the world. He will also share his work at MIT and show how geomatics has contributed to the world-leading research at MIT. The lecture will be at 4:00 PM in room C-11. 2016-March-17: GGE Spring Graduate Seminar. Details. 2016-March-2: Gordon Yamazaki will be giving a presentation about how the Canadian Rivers Institute has utilized geomatics in the Mactaquac Aquatic Ecosystems Study. The lecture will be at 4:00 PM in room C-11. 2016-February-24: Recent GGE graduate Lukas Fraser will be giving a lecture about the work that he has been involved with at Leading Edge Geomatics and talking about what from his degree has been useful and what is different. The lecture will be at 4:00 PM in room C-11. 2016-February-12: Maria Dolores (Lola) Arteaga Revert presents her Ph.D. dissertation proposal at 11:30 AM in C-25. Details. 2016-February-10: Dr. Jonathan Beaudoin will give a talk about what it is like to work in the ocean mapping field at 4:00 PM in C-11. 2016-February-5: Mohammad Rezaee presents his Ph.D. dissertation proposal at 2:00 PM in E-13. Details. 2016-January-28: Schlumberger will give a presentation at 12:00 PM in E-4, with interviews to follow. 2016-January-27: Dr. Attila Komjathy will give a talk about what it is like to work for JPL (NASA) in GNSS at 4:00 PM in C-11. 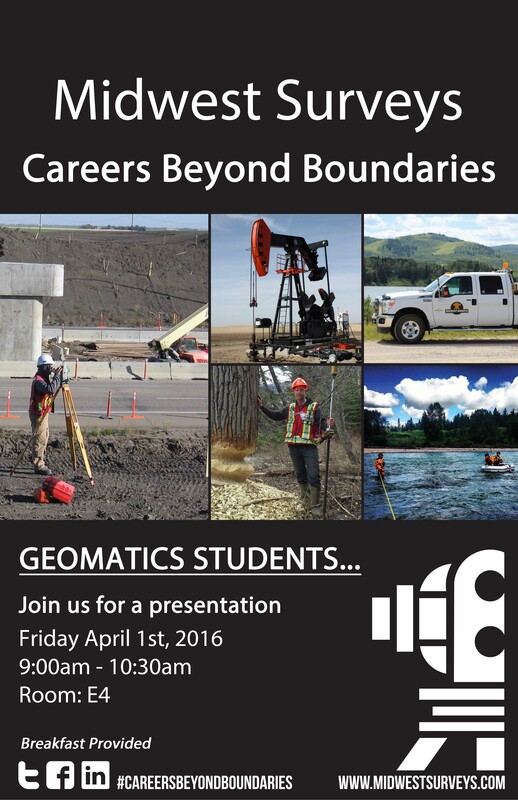 2016-January-26: Challenger Geomatics will give a presentation at 9:30 AM in E-4, with interviews to follow. 2016-January-5: Trimble will give a presentation at 11:30 AM in E-4, with interviews to follow. Details.